"The reality is, downtown trash has been a big problem for a long time and this showed beneficial results almost immediately." 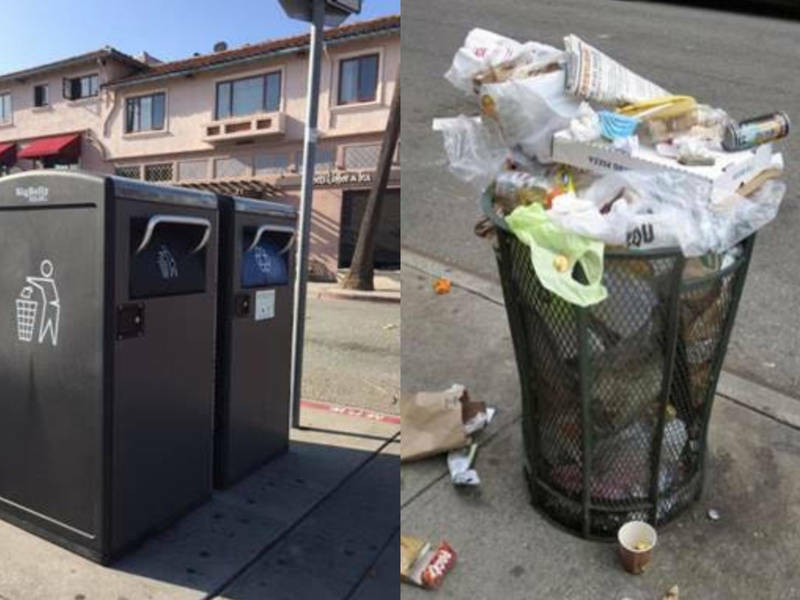 MILLBRAE, CA — In 2013, the City of Millbrae, in conjunction with South San Francisco Scavenger Company, launched a pilot program to see how effective Big Belly solar compacting trash cans would be in reducing trash overflows and staffing costs for high use trash cans throughout Millbrae's downtown. The results were overwhelmingly positive as the Bigbelly's held 10 times as much trash and significantly reduced the amount of staff time needed to empty and maintain them. "Through the pilot project, the Bigbelly's showed us that they were a financial and social benefit to the City," said Millbrae Mayor Gina Papan. "After we analyzed what areas could benefit most from the Bigbelly's, we made the prudent decision to purchase more. The reality is, downtown trash has been a big problem for a long time and this showed beneficial results almost immediately." In 2015, the City started purchasing more Bigbelly trash cans. At that time, the Bigbelly unit cost was $3,500 each, but the price has since increased to $4,100, which includes electronic notification software and ashtrays. Over the past three years, the City has reduced its collections from four to five times a week to just once a week, pushing costs down 50% of what they previously had been. These savings have allowed the Big Belly trash cans to pay for themselves over the life of the program. As part of the initial plan, the City received a cost estimate from an architect that included the purchase, shipping and installation of the Big Belly units by a third-party contractor. That estimate would have cost the City $12,000 for each unit. The City rejected that estimate and in turn purchased the Bigbelly units directly from the manufacturer, utilizing public works' staff to install the units. The cost of each unit was $3,500 to $4,100, and not $12,000 as estimated by the architect. "The Bigbelly's have been a great investment and are paying for themselves through savings in staff time and other collection costs," said Mayor Papan. "Buying the Bigbelly's has reduced our costs while keeping our streets and waterways clean. I can't think of many other investments that pay for themselves and keep our community and environment clean." The purchase of the Bigbelly compacting trash cans was made in part through the City of Millbrae's 2016/2017 Capital Improvement Program to support downtown enhancement, economic development, and street beautification efforts. Other purchases made through the program included sidewalk repairs, new bike racks, street lighting, newspaper racks, and benches, as well as other improvements.